The Tribunal of the Holy Office of the Inquisition, commonly known as the Spanish Inquisition (Inquisición española), was established in 1478 by Catholic Monarchs Ferdinand II of Aragon and Isabella I of Castile. It was intended to maintain Catholic orthodoxy in their kingdoms and to replace the Medieval Inquisition, which was under Papal control. We find similar 18th-century titles on the Spanish Inquisition for sale elsewhere for nearly $800! 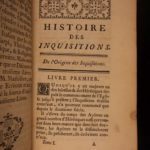 Title: Histoire des inquisitions; où l’on rapporte l’origine et le progrès de ces tribunaux, leurs variations et la forme de leur jurisdiction. Published: Cologne : Pierre Marteau, 1759. Publisher: Cologne : Pierre Marteau, 1759.